Summary: Despite being named Alistair, Alistair has a pretty typical childhood, until the school weirdo Fiona Loomis decides to re-enter his life with a request that he write her biography. That’s when she tells him about the Riverman, an unknown entity who is the cause of a rash of child disappearance and abduction cases around the world. As Alistair falls for Fiona, he must separate truth from fiction and decide whether her story is true, a mere fancy or a shield that hides a much darker secret. 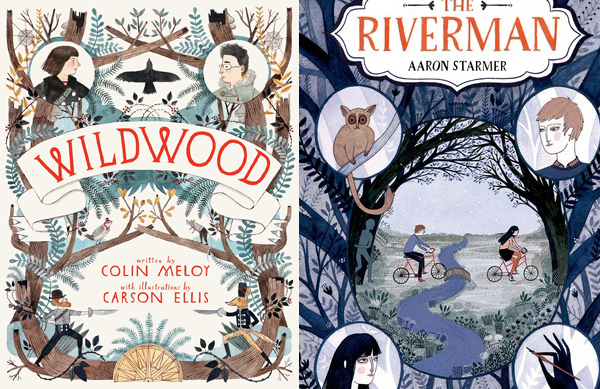 I have to admit, The Riverman (which GoodReads claims is the first in a trilogy) originally caught my attention because the cover looked super similar to the artwork on Colin Meloy’s trilogy Wildwood (illustrated by Carson Ellis), which is about some magic woods and their relation to the lives of the hipster children (kid hipsters and the children of hipsters) living in Portland. You can see a comparison of those two covers below (waaay below) if the mood strikes you. 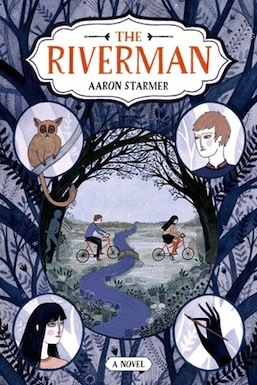 However, I am extremely glad I was pulled in by Yelena Bryksenkova’s artwork, because author Aaron Starmer’s premise was just the right level of intriguing and creepy, seeking to explore a boy and a girl fighting against the forces of the mysterious Riverman, who steals the souls and stories of imaginative children. Or so it would seem on the surface. Kindly insert your dun dun duns here. Sure on the outside the novel seems like a book about a boogie man that children need to fear, but it goes so much deeper than that, exploring the flawed nature of memories (although the majority of this occurs in the opening of the novel and the epigraph) and even more so about how the unbelievable stories people tell themselves in their own imaginations are merely coping mechanisms to deal with the world at large. This is explored through Fiona, who comes to her childhood friend Alistair and claims that she is able to travel to a world called Aquavania (through some floating water near her radiator), where her imagination can actually create worlds. As she explains, Aquavania is the place “where stories are born” and travel into the minds of artists and writers to come to fruition. The children who enter Aquavania use their imagination to fill their needs — as they seek to do in the real world, but in this case their imaginations are made flesh. Or as real as they can be in this other dimension. I’m a little fuzzy on the exact mechanics. Unfortunately, her friends, other children inside Aquavania are being destroyed by the nefarious Riverman, who uses his pen to steal their souls. In this case their souls (their essence) are their very selves, their imaginations if you will, which he takes to suit his own needs. They don’t quite know what he wants, all Fiona knows is that her friends are disappearing in Aquavania and going missing in the Solid World as well. Ever the realist, Alistair takes this fantastical tale and assumes that Fiona is attempting to cope with her deranged Uncle, who rumor has it — thanks to the town gossip — returned from the war a tad altered. Furthermore, Alistair sees the Riverman as not only a physical person threatening Fiona but as a metaphor for those who seek to steal that which we most need in our lives. Happiness? Love? Pick your poison. The Riverman isn’t just about all that however, it’s also about young and first loves, which seem cute to the adults watching them blossom, but hold a greater meaning to those who are experiencing them. Just ask Romeo and Juliet and their notions of true love. Alistair experiences this more than most as he goes around asking his elder sister if girls need boys to save them. As most boys raised in our society, he is under the false belief that girls need protection from monsters and may be in need of a Lancelot of their own, although he seeks to save Fiona from her own personal demons which are a little more real than most. Bonus: the entire novel takes place over the course of six weeks, from October 13, 1989 (Friday the 13th to be precise) all the way through November 20th. So expect plenty of fun ’80s tidbits like tape players and neon jackets and white leggings. I’m having flashbacks. Horrible, horrible flashbacks. For other novels that look into the memories of our childhood and the exploration of how flawed they may be, take your next step into the genre that sounds like it was written by Netflix with Neil Gaiman’s The Ocean at the End of the Lane! That was a terrible simile, but just go with it. I know you wrote this review almost a year ago, but I wanted to pop in and say “hi.” I just finished reading this and I went looking for others’ opinions; I was pulled into your review by the description of Wildwood. I laughed. The real world is often more interesting than the Aquavania that Fiona tells Alistair about. I took this to mean that the real world is, well, real, and Aquavania is invented; whether Fiona is lying or if she really believes or both, I don’t know, but of course her made-up world wouldn’t have the depth and interest of the real thing. I figured she read about the missing kids. … then the end happened, and I’m not really sure what I think. Agreed! Maybe the next book in the series will start to shed some light on what is really real and what is really imaginary.